With just under 1000 varieties, Salvia is the largest genus in the mint family (Lamiaceae). Commonly known as sages, Salvias come in a dizzying variety of forms and colors. Salvias can be evergreen or deciduous shrubs, or perennial, biennial, or annual flowering plants. Although their flowers are most commonly a shade of blue or purple, different species of sages also produce white, yellow, pink, red, or even bicolor blooms. As members of the mint family, all Salvia flowers are two lipped (bilabiate) and commonly arranged in dense spikes. 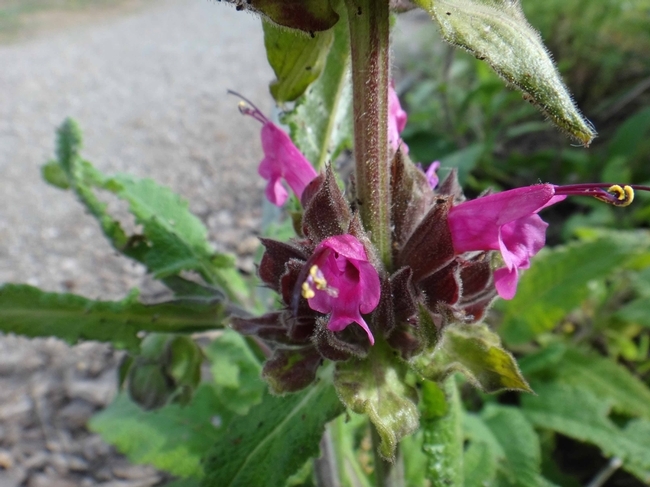 Salvia leaves are usually found in pairs opposite one another on square stems, but the leaves may also be arranged singly on the stems of shrub species of Salvia. Salvia foliage is aromatic, giving off a mint-like odor when crushed. 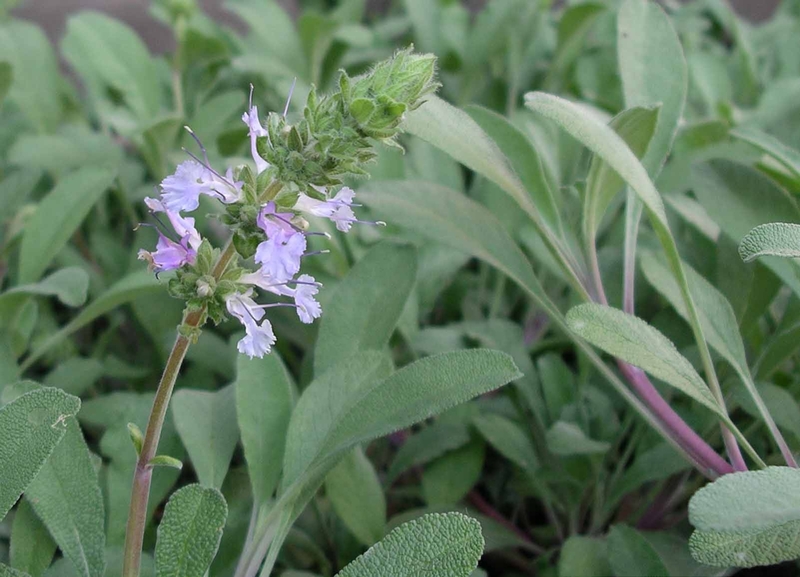 Sages of the genus Salvia should not be confused with sagebrush (Artemesia), which has none of these characteristics and is a member of the sunflower family (Asteraceae). 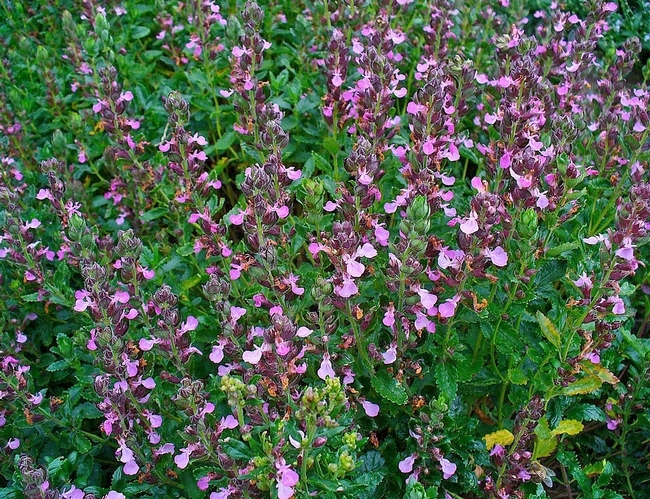 The characteristic of the genus Salvia that sets it apart from the rest of the mint family is the structure of its flowers. The stamens of these flowers form a lever and when a pollinator enters the flower, the lever causes the stamens to move and deposit pollen on the pollinator. When that pollinator enters another flower of the same species, the stigma of the flower is situated so that it brushes against the pollen on the pollinator's body, virtually guaranteeing pollination! In addition to stunning flowers, the handsome, fragrant Salvia foliage ranges in color from various shades of green to pale grey. Additionally, many Salvias have an extended blooming season (some even lasting from spring through fall) and their flowers attract a wide variety of pollinators, including hummingbirds, butterflies and bees. Salvias also tolerate a wide variety of soils and many thrive in full sun, needing minimal water during our hot, dry summers. These plants are also low maintenance and relatively disease and pest free. A final, but certainly not insignificant plus for these plants is that they are generally deer resistant. Apparently the chemicals that give Salvia leaves their distinct, minty odor have a disagreeable taste, and the result is that deer rarely graze on them. 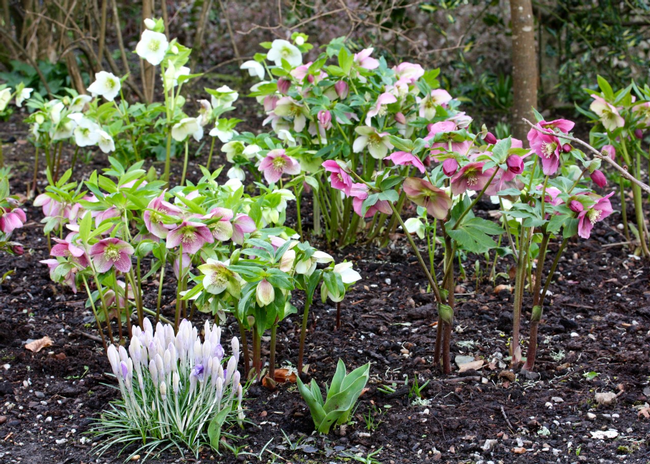 What's not to like about these tough, attractive plants? 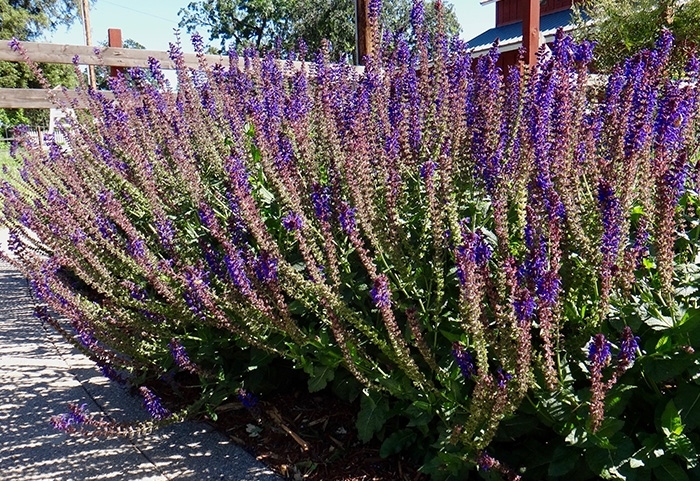 Several Salvia species are on display at the Master Gardeners Demonstration Garden at the Patrick Ranch Museum (located at 10381 Midway between Chico and Durham). Popular Salvias found at the Demonstration Garden include: Black and Blue Sage (Salvia guarnitica), Creeping Sage (S. sonomensis), Hummingbird Sage (S. spathacea), Autumn Sage (S. greggii) and Cleveland Sage (S. clevelandii). 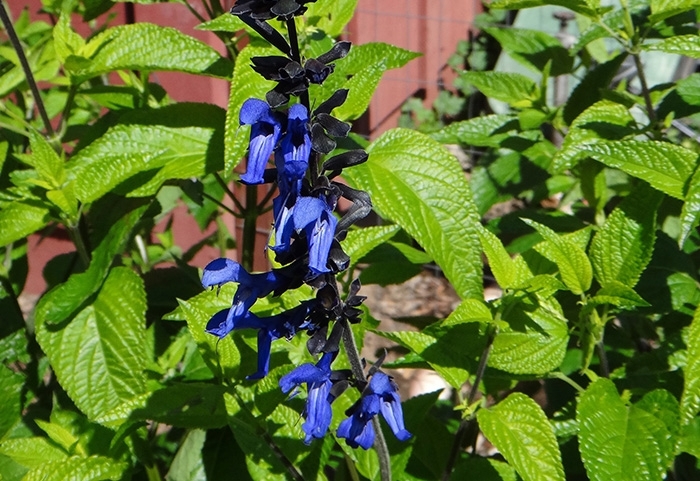 Black and Blue Sage has intense, deep blue flower petals with an almost black calyx (the leaf-like structure at the base of the flower); it blooms from summer through fall. Found in the Butte All Stars section of the Demonstration Garden, it grows to a height of three to five feet, has light green leaves, and will grow in full sun or partial shade. 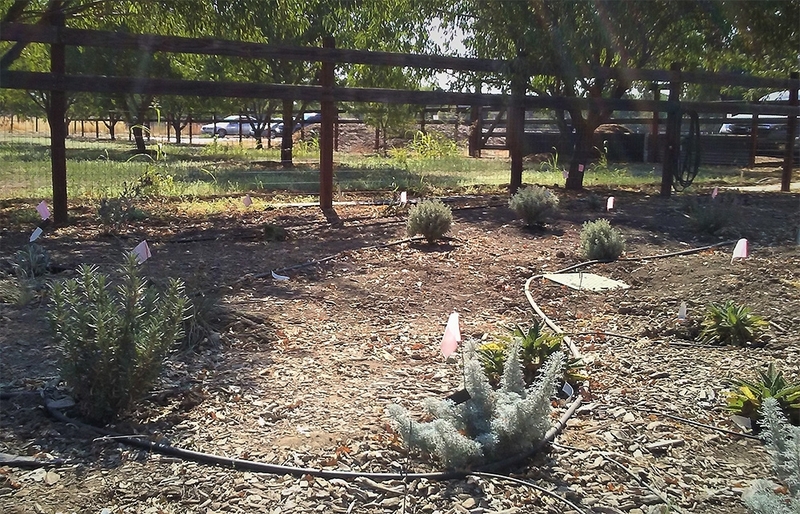 Although S. guarnitica prefers moderate irrigation, it can tolerate dry conditions. It is a perennial in the valley and foothills, but is treated as an annual in areas where winter temperatures regularly drop below 20° F.
Creeping Sage and ‘Bee's Bliss' Salvia are similar groundcovers. Both are found in the California Native section of the Demonstration Garden. These evergreen perennials reach a height of four to six inches, and a single plant can spread 12 feet or more. Their foliage is a pleasing silver-green. 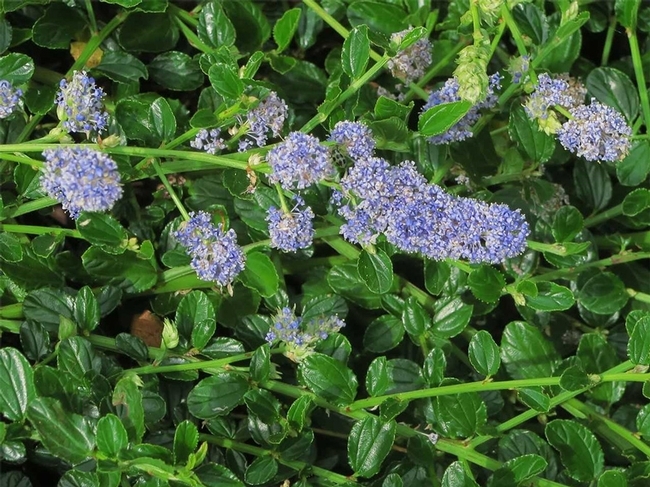 They produce a profusion of blue-violet flower spikes from spring to early summer. 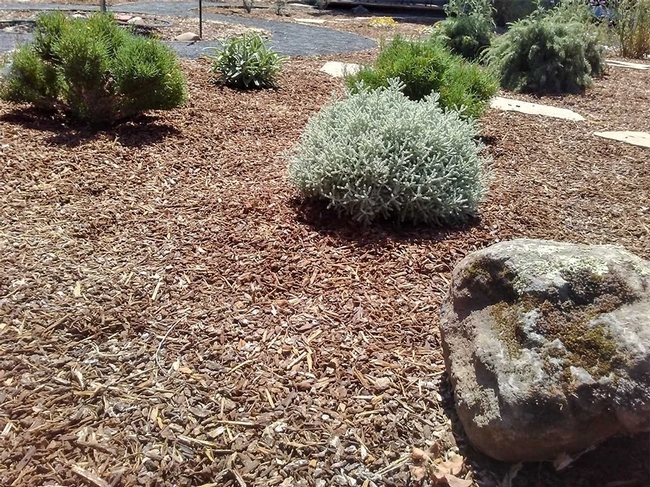 These plants are moderately drought tolerant and will grow in full or partial sun. With its large, deep red, tubular flowers, Hummingbird Sage (S. spathacea) is literally a hummingbird magnet. This California native is planted in the Mediterranean section of the Demonstration Garden, where it blooms from March to May. 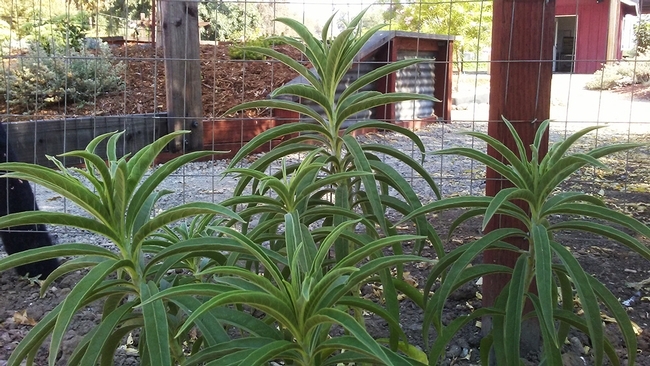 It is an evergreen perennial with bright green, oblong leaves that can have a puckered appearance. Hummingbird sage grows from one to three feet tall and up to three feet wide. 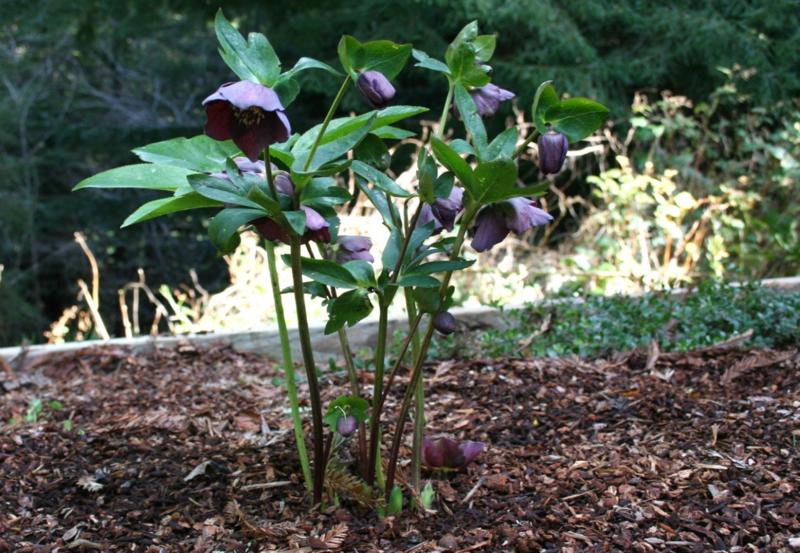 This plant will grow in full sun, but prefers partial shade, making it ideal for growing under oaks. 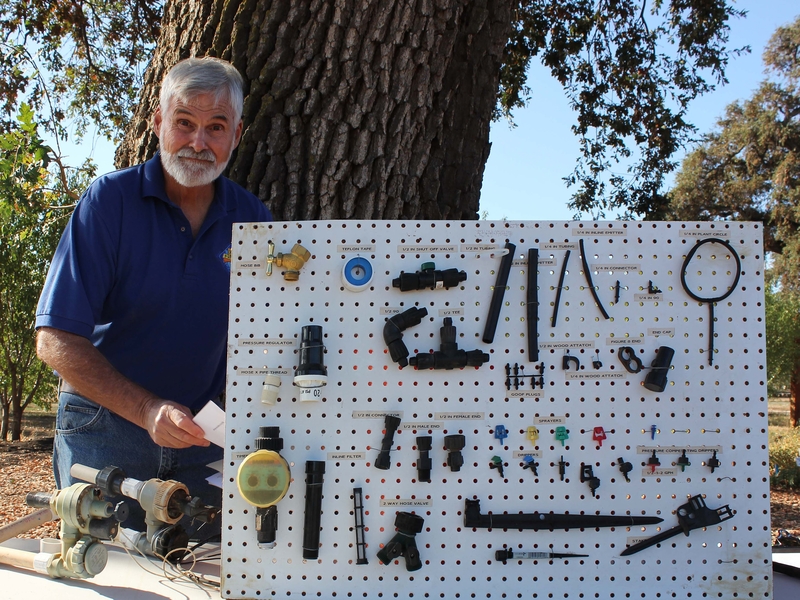 Once established, it requires very little water. 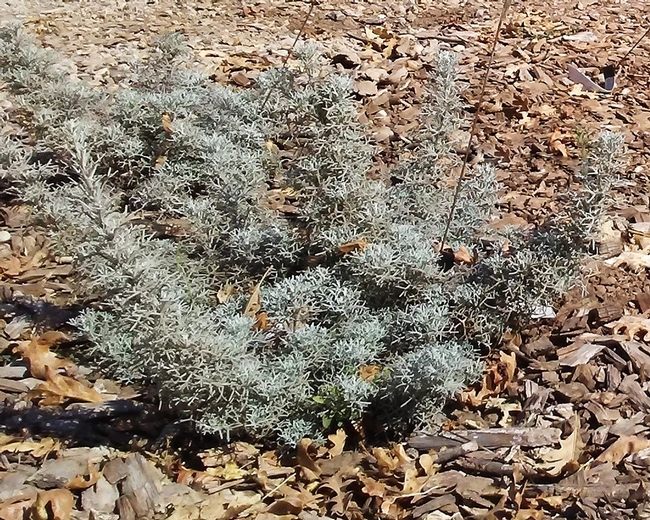 Autumn Sage may be one of the few plants that is best known by its scientific name, Salvia greggii. 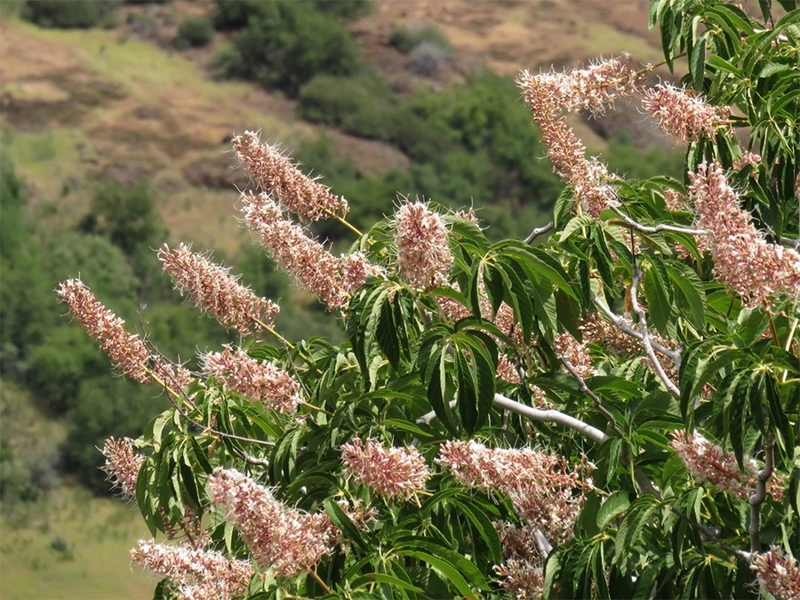 This plant blooms from early summer through fall and flowers of S. greggii are usually some form of red, but can also be bicolor, white, pink, rose, purple and or orange. 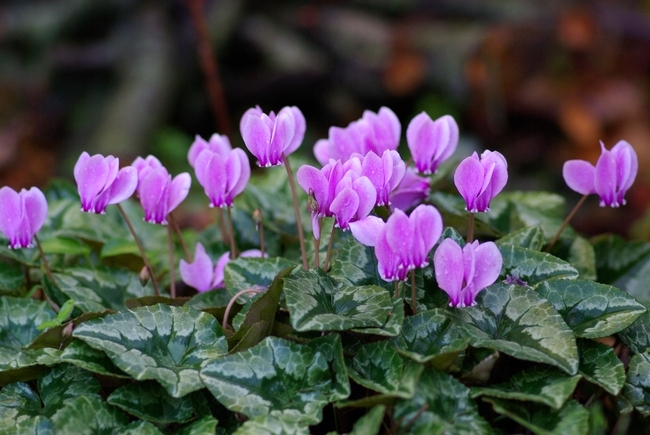 It is an evergreen perennial, but can be winter dormant in colder areas. It grows two to three feet tall and as wide. 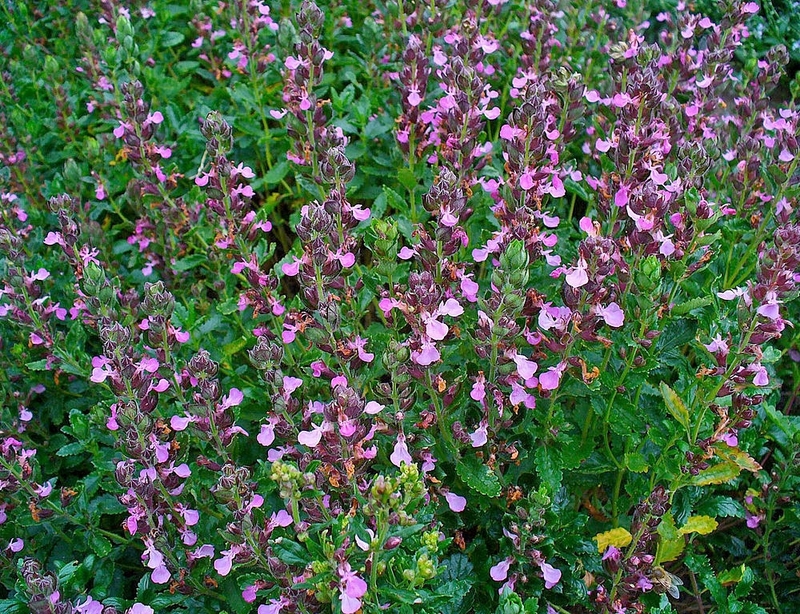 Like many Salvias, Autumn Sage thrives in full sun and requires very little water. 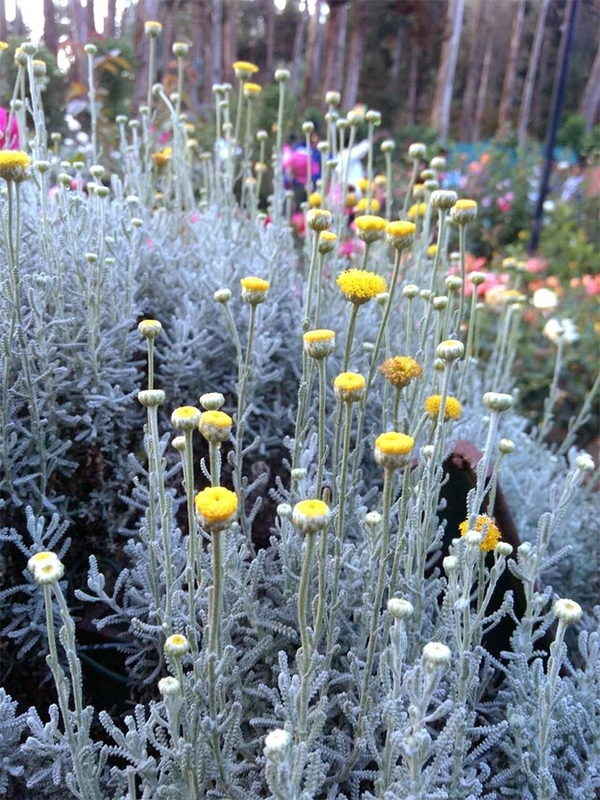 There are several examples of S. greggii in the Demonstration Garden. 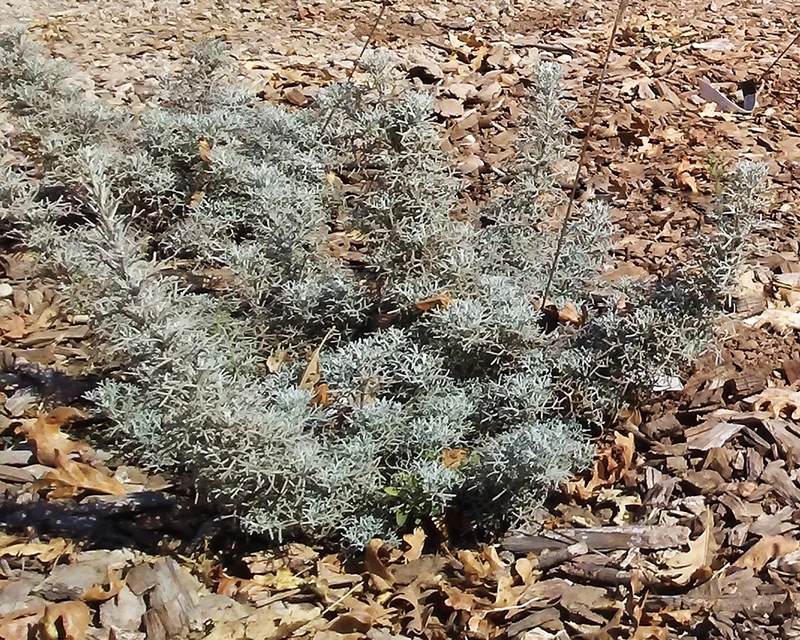 Cleveland Sage is a popular woody shrub that has small hairy grey-green leaves. 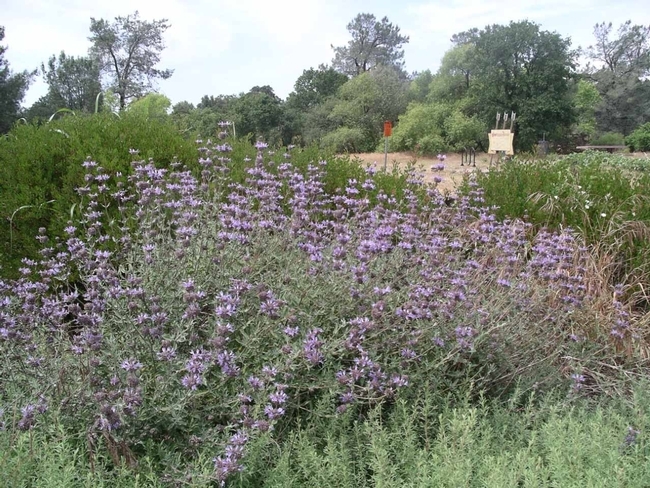 According to the Calscape website of the California Native Plant society, some consider Cleveland Sage to have the “most pleasantly fragrant foliage of any Salvia.” The Native Plant section of our Demonstration Garden contains the cultivar Salvia clevelandii ‘Winifred Gilman', which has round clusters of intense violet-blue flowers that appear from late spring through summer. 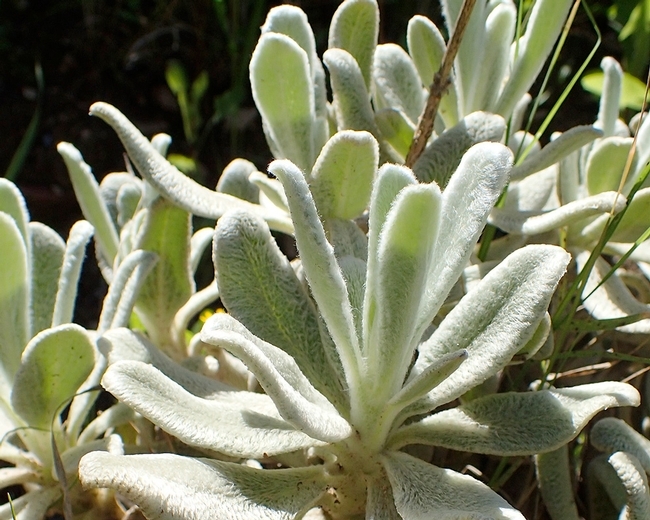 Cleveland Sage reaches a height of three to four and a half feet, usually growing twice as wide as it is high. 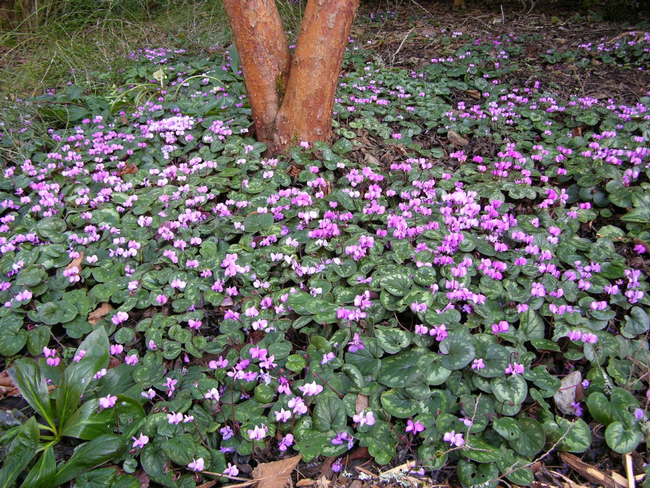 It prefers an exposure in full sun or part shade and requires no summer water once it is established.